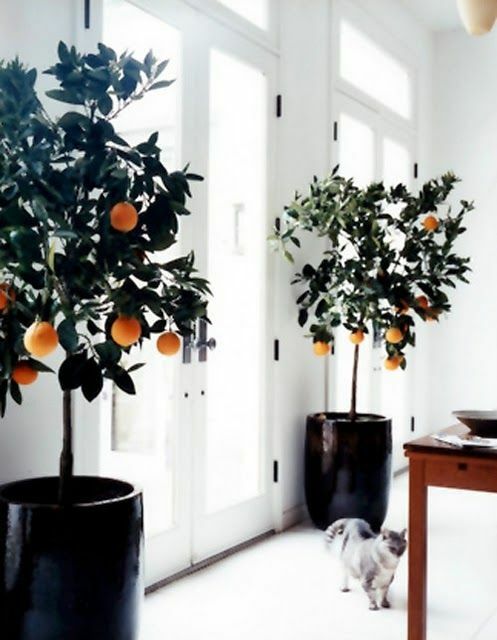 I have always loved citrus trees and found it such a treat to grow up in the middle of citrus groves. The trees are a welcome sight in the middle of the desert. Not only do the fruit smell and taste really good but the leaves stay nice and green despite all of our heat. Anyway, if I had enough light in my home then hands down I would have a couple of dwarf lemon trees indoors. According to Martha these kind of trees are easy to grow indoors. 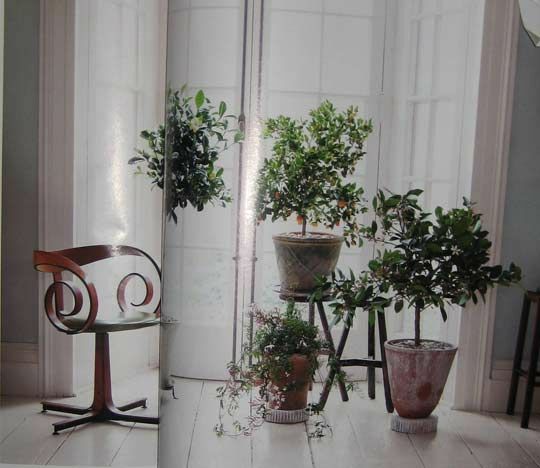 Here are some suggestions for some of the best citrus tress to grow indoors and here are some suggestions on how to grow them. 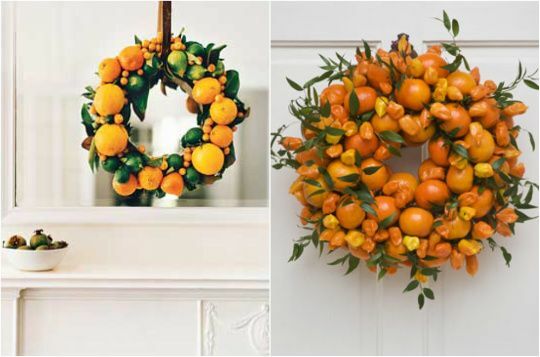 If I can't grow the trees indoors then I can certainly go outside and pick the leaves and the fruit to make garland or a wreath. 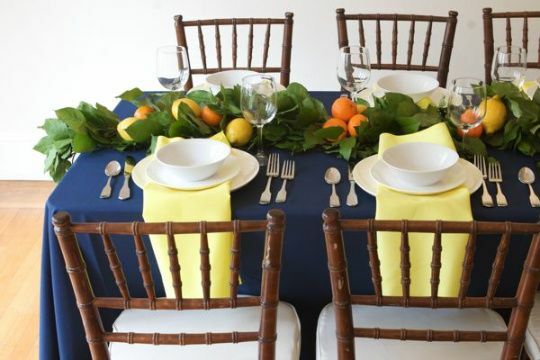 Jordan Ferney has already posted a cool tutorial on the above garland. Go here to check it out. Happy day wishes to all!! P.S. - If anyone has had experience with growing citrus trees indoors pls. share anything you have discovered. I have a bunch of these, I killed a few last year when I left them outside too long. They have MASSIVE thorns. Not something that is fun to replant. I'm talking, two inch pokey thorns. The cats love to poop in their pots. I have not yet gotten any fruit off of them. But my general plan is to get a greenhouse and keep them out their fulltime. I keep hoping they'll get fruity soon. Top shot tops my lust list! I have several citrus growing outdoors, but back when the top spread came out, my mom swore I wouldn't be able to grow these successfully indoors. However, I notice Vivaterra sells the dwarf table-top specimens, so maybe you should give it a go and report back. Yeah, I've heard Meyer lemons grow great indoors. Never tried it, but I've always wanted to. Aren't they gorgeous? I'm so relieved to read that all those photos aren't your personal residence because at first I thought they were and I was going to die of jealousy right here in my living room. I have never heard of anyone doing this in my neck of the woods (cold and dry Colorado isn't the optimal climate for citrus), but now you have me dying for a greenhouse so I can order some orange and lemon trees. Beautiful with the pots! Especially the first image. Oh how I wish I could have citrus in my home of garden...the trees are so beautiful and always feel so european to me. These are so beautiful! It's such a lovely and natural way to introduce a little color. Thank you for the inspiration! I tried growing two dwarf lemon tress last spring outdoors and they lost all their leaves I am going to try again this year…maybe indoors this time! I live in Utah where my lime tree thrives outside in the summer and does fairly well in my living room in the freezing winter. In fact, despite not getting too much direct sunlight, it's got little blossoms on it right now. The limes are juicy and big. Of course, since it lives on my front porch in the summer, most of the limes get picked off by my kids and the neighbor kids before they are fully ripe. But I love my tree and it's not hard to take care of! I have had a lemon tree on my wishlist for ages! This spring is my year to take the plunge! I wish my apartment got enough light and warmth to be able to grow citrus indoors, they are so pretty and add lovely color!